Today’s guests: Bishop Daniel Reilly, bishop emeritus of the Diocese of Worcester, Mass. ; Angelo Guadagno, organizer of the Worcester Catholic Men’s Conference; Deacon Jack Sullivan of St. Thecla Parish, Pembroke; and Fr. Dan Hennessey, director of the Office for Vocations of the Archdiocese of Boston. Today’s topics: Lenten retreats, the annual Archdiocesan Eucharistic Congress, the Worcester Catholic Men’s Conference, and the miraculous intercession of Blessed John Henry Cardinal Newman. 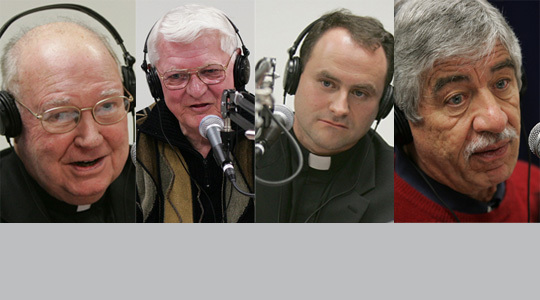 A summary of today’s show: The Worcester Men’s Conference was the seed of the nationwide Catholic men’s conference movement over the past decade, and that tradition continues at this year’s conference later this month. The keynote speaker will be Deacon Jack Sullivan of St. Thecla Parish in Pembroke, whose miraculous healing from a spinal ailment led to the beatification of Bl. John Henry Cardinal Newman. And on April 1 and 2, the fourth annual Eucharistic Congress for Youth and Young Adults will take place in the North End of Boston as hundreds of youth witness to the power of Christ in their lives. 1st segment: Welcoming Fr. Dan Hennessey. He reports that there are many men interviewing and considering applying for the seminary this spring. He talked about the St. Andrew’s Dinner for young men in high school. The most recent dinner welcomed 75 young men. There also retreats for men 18-40 held at St. John Seminary and for men older than 40 at Blessed John Seminary. There are currently 59 men studying for the archdiocese at St. John Seminary, Blessed John XXIII Seminary, Our Lady of Providence Seminary, and the Pontifical North American College in Rome. Interested men should call Fr. Dan at 617-746-5949 or through the Vocations Office website. 2nd segment: Scot welcomes Bishop Daniel Reilly and Angelo Guadagno. Bishop Reilly was bishop of Worcester for 17 years and one of his passions was working with men. He doesn’t like to consider himself as retired, just emeritus, and so as long as he has the capacity to minister he will be there with the people and be a witness to faith. Bishop Reilly and Angelo and others launched the Worcester Men’s Conference 11 years ago and it was the first men’s conference in the country. At the time, PromiseKeepers was a large Evangelical movement for men, and Catholic men were coming to Bishop Reilly and wanted something similar. Shortly after that, a pastor called the bishop about a man who wanted to serve the Church. That was Angelo. They met and talked about ministry for men. At first they worked with other dioceses in New England, but in 2001 they decided to go forward on their own in Worcester and it has been very successful and uplifting. It gives the men who attend something to direct their Lenten journey toward. The talks of the conference carry them throughout the year and give men’s groups a foundation to build upon. Angelo said men usually come to the conference because they were invited by someone and thus the conference is an environment of fellowship. Men come to the conference because it’s easy in these days for a man to feel isolated and alone, but when he comes to the conference and sees 1,000 men who are like him, have his values, his point of view, then he no longer feels alone. The second reason is that it’s easy to plateau in our faith, to think that because we go to church every Sunday that’s enough, but the conference gives a challenge and the tools and incentive to take another step in faith, to move up one notch, to keep doing one more thing. The men also come to learn, to laugh, and to leverage, to leverage what they learn in order to be a better husband, dad, and man and it stays with them for the rest of the year. About 70 other dioceses have copied what has happened in Worcester and it must be fulfilling to see how their work has taken fruit. Bishop Reilly said it was just reading the signs of the times, that there was a natural desire for this type of ministry. It was providential for Angelo to come along and it just took off. It seemed to be all a part of God’s time. Angelo spoke about the speakers at this year’s conference. Kicking off will be Deacon Jack, who we will hear from in a few minutes; then Mark Shea, author and speaker, on the 101 reasons to not be Catholic and the one reason to be one; Fr. Dave Cavanaugh on rediscovering confession as part of the path of the Prodigal Son and preparing men for the work of the new evangelization (Typically, the confession time is a highlight for the men; last year the conference organizers received hundreds of positive comments from men who experienced the sacrament); Kellen Clemens, a quarterback for the NY Jets on living as a Catholic within the pressure cooker of the NFL and the high profile life of a professional athlete in New York City; and Michael Franzese, a former Mafia don with a bounty on his head who has had a major conversion experience. The conference is March 26, 2011, starting at 8:30am and ending with Mass at 4pm. Bishop Reilly talked about the experience of hearing the confessions of so many men at the conference. First, there’s the atmosphere of the whole conference with so many powerful talks to inspire the men. Then at 11am, about 50 priests come in and hear confessions for two hours. And the men line up to give their confessions, each to a randomly selected priest, face to face. And the quality of the confessions is very high, the bishop said. Fr. Dan said that seeing so many come to confession is a grace for the whole diocese, but also for the priests. Scot said that it’s a way that men in mass numbers can meet the mercy of Christ. When you see men leave, they’re standing taller. And when the priests leave, they’re energized at what they have seen. 3rd segment: Deacon Jack Sullivan joins the panel. He will be one of the speakers at the Worcester men’s conference and it is the first men’s conference he will speak at. In 2001, he had just concluded his second year of his diaconal formation for the Archdiocese of Boston when he awoke one day with horrendous pain in his back and legs. Five or six of his vertebrae had turned inward and began squeezing his spinal cord. There had been no accident or trauma; it just happened. A surgeon specialist told Deacon Jack that he likely would be paralyzed and he was scheduled for surgery about the same time he was to return to his third year of classes. He consented to the surgery for the sake of his work and family, even though he would have to drop his diaconal program. Even so, recovery would take months. He returned home and turned on EWTN, only to hear priests speaking about Cardinal Newman and about the difficulties Newman experienced throughout his life. At the height of his fame as an Anglican preacher in England, he converted to Catholicism. At the end of the program, Deacon Jack saw a notice that anyone who experienced favors due to Newman’s intercession should contact the cause for Newman’s canonization, so Deacon Jack prayed with all his heart to be able to continue his classes. The next morning he awoke without any pain. He was examined by his doctor, one of the foremost spinal surgeons in the country. His spine was still deformed, but he had no pain, and so the surgery was canceled, although the doctor fully expected the pain to return. Nine months later, the day after the last class of his second semester, the pain returned. Deacon Jack thanked Cardinal Newman for interceding so he could finish his classes. He had the surgery and there were unforeseen difficulties that resulted in further problems and a bleak prognosis. After the surgery, he was told he wouldn’t be able to enter his fourth year of classes in two weeks. They didn’t know whether he would ever walk again and if he did it would take months of rehab. After four days of thinking about it, Deacon Jack decided to try to walk and in excruciating pain, he prayed again: “Please, Cardinal Newman, help me to walk so I can return to classes and be ordained.” Suddenly he felt tremendous heat and a tingling sensation all over his body. He also felt a strong sense of peace and love. He was totally consumed by the experience; like experiencing a piece of heaven. When he started to come out of this state, he had a strong feeling he could walk. So he said to the nurse, “I have no more pain.” At this point, he was standing, rather than being hunched over in agony. He had no need for a walker and began walking all around normally. Deacon Jack submitted the miracle to the postulator for the cause, and it was investigated by the Church, which determined that there was no medical or scientific explanation for the cure. The experience of receiving the miracle starts with asking, “Why me?” But he also thinks God wanted to honor the life of service of Cardinal Newman to the Church and how he has affected so many thousands during and after his life. Somebody had to experience it, and Deacon Jack said he guessed that the Lord needed someone lowly. God is active in performing miracles today and this miracle is not just for Deacon Jack, but for all of us. Bishop Reilly said that in Jesus’ public ministry, he did not heal everyone. He healed some, while others learned that they just have to put their faith and trust in God. Fr. Dan asked how people have reacted to the story. Do people question it or do they just say Wow? Deacon Jack said he’s learned some lessons. For one thing, he now knows that Cardinal Newman is alive in heaven and it shows that the kingdom of heaven is real. Also, it makes him face his trials and sorrows and those of others with a different attitude. These situations are opportunities to exercise our faith. Newman believed in divine providence, that God loves us intensely, and wills us to receive some greater good out of our experiences if we just have faith and trust in Him. It’s a good lesson for Lent: If we have faith, it will be okay. Pray to the Lord, Our Lady, Blessed John Henry Newman and the other saints for intercession. While Deacon Jack only prayed to continue his studies, God healed him because God knew what Deacon Jack really needed. Bishop Reilly said it tells us that we should be people of faith who ask God to see our need, and to ask Him specifically for what we need to serve God’s will. It has to be within the context of faith, not for show. Bishop Reilly hoped that the men at the Worcester conference who hear the talk will see that we’re here in the world to live our faith and to let people see it. Chesterton said, “We don’t need a church that moves with the world, we need a Church that moves the world.” That’s what happened here with Deacon Jack, he said. At the Eucharistic Congress, one of the major features is a procession through the North End with the Eucharist. It’s on a Saturday night in the North End, so there’s usually a lot of people who see. There’s a Mass with Cardinal Sean on Saturday night. There’s also a time of confession and Eucharistic adoration. The young adult organizers also plan service projects as part of the weekend. One of the projects is to go to the Boston Common with the Little Brothers of St. Francis to hand out supplies to the homeless. Another is to go to a park in the North End to clean up. Fr. Dan expects 500-600 to attend this year.